The aluminum body of the Jaguar C-X16 concept is designed for maximum torsional rigidity, and it has a 50-50 weight distribution. DETROIT -- Certain cars carry the weight of history and must be conceived with a sense of purpose that honors their heritage yet elevates the brand and moves it forward. They're halos and at the same time standard-bearers. A Jaguar coupe is the epitome of such an automobile, and on Tuesday, the latest in the lineage was revealed: the 2012 C-X16 concept. The C-X16 debuts in the flesh at the Frankfurt auto show next week, and this car is Jag's vision for the future, signaling a dramatic style and a potent hybrid powertrain. It's a design study, punctuated by a range of technologies. "For me, this is the most exciting car we've done to date," Jaguar's design director Ian Callum said. The C-X16 is marked by a long hood with the wheels pushed out to the corners. There are three so-called "heartlines" which form the silhouette. The aluminum body is designed for maximum torsional rigidity, and it has a 50-50 weight distribution. It rolls on 22-inch alloy wheels, set beneath fenders that give the appearance of haunches. It's not the next E-Type, but the Jag designer is OK if you think you see that in the curves. "It's very much a part of our heritage with the rise of the lines over the wheels," Callum said. Though the wrapping is striking, what lurks under the hood is also a harbinger of Jaguar's potential hybrid prowess. The concept employs a supercharged 3.0-liter V-6 pushing out 375 hp and 332 lb-ft (450 Nm) of torque. That works with an electric motor that makes 94 hp and 173 lb-ft (234 Nm) of torque, available with the push of a button on the steering wheel. The eight-speed transmission has stop-start and kinetic-energy-recovery systems. All of this allows the car to sprint to 100kph (62 mph) in 4.4 seconds en route to a top speed of 300kph (186 mph). Jag dubs it a 1+1 coupe, but in reality, it's simply a two-seat configuration. The cabin has extensive red materials, a twin-dial instrument panel, leather and Alcantara fabric. Carbon fiber and dark chrome are among the accents. This concept is meant to surprise and seduce. 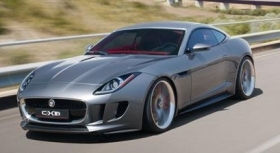 The $6 million question is, will Jaguar build it? Callum says it's feasible, but no confirmation is evident. "It wouldn't be too much of a trial to turn it into a production car," he said. "I think it would be a fabulous production car. I hope we do it."